Originally, I was planning on writing about the Rideau Centre for this post; where it came from, what it replaced and how it impacts the urban landscape today. 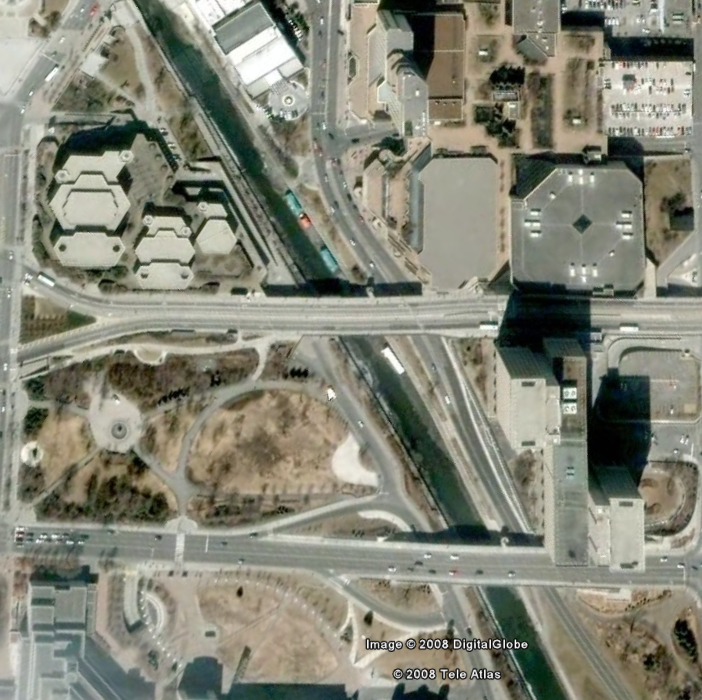 However, whenever I set out to do something I almost inevitably get sidetracked by something, and while researching this post I ended up coming across a series of aerial photos showcasing the evolution of a particular area of Ottawa. And, if you know anything about me, you know that I was almost instantly fascinated, and I decided I had to craft a post around it. Make more sense now? The dark section running up the middle, is the Rideau Canal. I find this image really interesting, because it really shows off Ottawa’s roots as an industrial lumber town. In 1920, Ottawa had been Canada’s capital for less than 60 years and it shows. 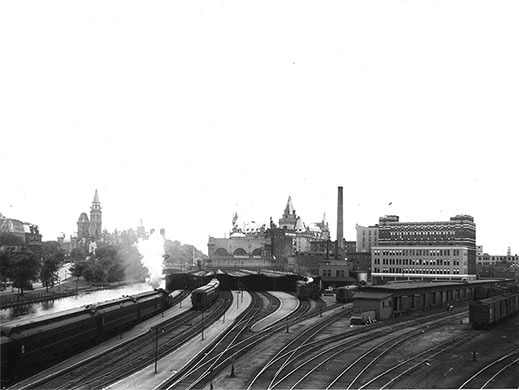 Where the Rideau Centre is today, a large rail yard sprawls just a few hundred metres away from Parliament Hill. Next to it, a quay juts out from the canal, likely a staging ground for passengers and freight to change between the rails and the water. On the subject of passengers, Union Station dominates a stretch of land next to the canal, a stark contrast to the carefully manicured pathways that exist there now. To the south, a large military staging ground occupies the land where City Hall sits today. If it weren’t for a scattering of prominent landmarks, it’d be impossible to tell this picture is of Ottawa. A lot has changed in the 88 years since it was taken… follow the jump to see some of them. Before I move on, here’s a better angle of the shot above from roughly the same time period, as far as I can tell. 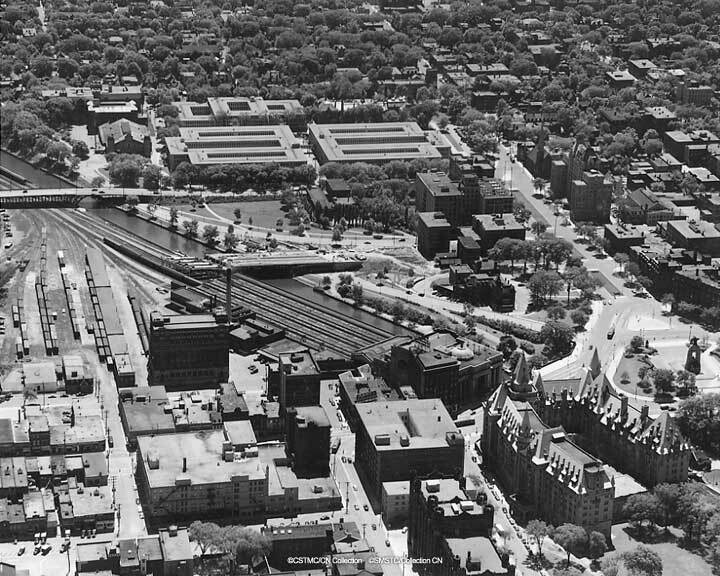 This shot has a slightly different scope; you can’t see the future site of City Hall, but you can get an idea of the scope of the railway infrastructure, as well as see up into the ByWard Market and into a somewhat less-manicured-looking Major’s Hill Park behind the Chateau Laurier. To put this into perspective, if you were standing where this photo was taken today, then you’d probably be right next to the National Defence Building, and looking up towards the Congress Centre and Mackenzie King Bridge. I really like this picture since it shows how much space downtown was actually taken up by railway tracks at one point—it’s almost astonishing when you think about how it looks now. All right, that’s enough of the 1920s. Let’s jump ahead, shall we? How does 1966 sound? Looks quite a bit different, doesn’t it? 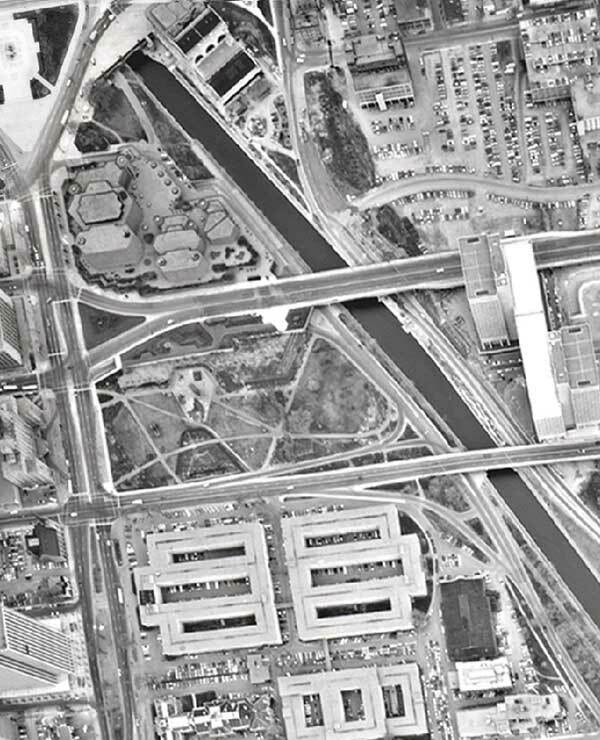 The hodgepog of buildings north of the future site of City Hall has vanished, replaced here by efforts to build the National Arts Centre and create Confederation Park in time for Canada’s centennial in 1967. And what of that future City Hall site? Well, it’s taken up by a sprawling complex of “temporary” buildings constructed during the Second World War as office space for military personnel. 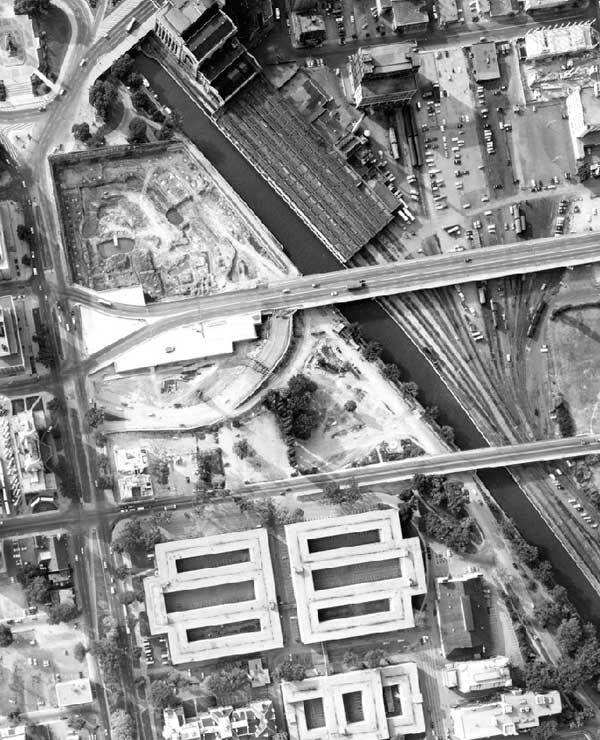 Meanwhile, tracks still run into Union Station, but not for much longer: 1966 was the year the National Capital Comission decided to take out the railway tracks and replace them with a path system and Colonel By Drive. Finally, Mackenzie King Bridge now stretches across the canal, still 15 years away from being made part of the backbone of Ottawa’s transit system. This is another angle from around the same time, though the large rail yard is still intact and Mackenzie King Bridge is only partly complete. You can also see the temporary military office buildings better from this angle, looking somewhat like an attempt to mimic the style of the American military’s Pentagon. Now things are looking more like the Ottawa we know today. The squat form of Place Bell can be seen in the lower left corner, and the now-complete National Arts Center sits in the top-left. 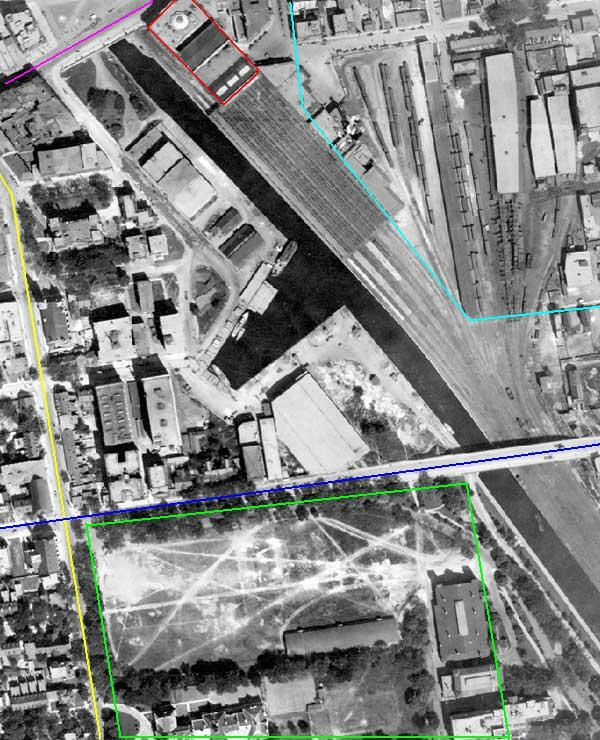 The temporary military buildings are still in place, but the National Defence Building now sits between Laurier Avenue and Mackenzie King Bridge, meaning they’ll soon be unneeded. Meanwhile, the canal is no longer lined by railway tracks, with Colonel By Drive and landscaped footpaths taking their place. Perhaps the most glaring difference in this image is the large field of parking lots that sit where the Rideau Centre now does. I have to say I’m glad that’s gone; I can only imagine what Rideau Street would be like if there were parking lots there instead of a well-travelled mall and transit stop. For sticklers, I’m pretty sure this comes from late-2007, so it’s about a year out of date, but I’m not too worried. I won’t describe this in any great detail since I’m sure the landmarks are familiar to most, but I will say that it’s amazing how much more complete it looks with the Rideau Centre in place of those parking lots. Sure it’s a mall, and it probably could have been built to respect the historic buildings that were on the site somewhat better, but all things considered, it’s quite an improvement from the air. I think, looking at this sequence of images, what’s truly amazing is the fact that this covers maybe a little more than one square kilometre of Ottawa. The changes here are incredibly drastic over a relatively short period of time in the grand scheme of things, and changes like this occured all over the city for periods even longer than this. We tend to think of the places we live as being very permanent, but in reality, they’re extremely fluid. You only need to step back a little bit, and you can see that fluidity in action. Great post, David. Nicely illustrated — I’ve seen a lot of these photos separately but it was interesting to put them in context to see the evolution. Came here from a plug in the OttawaStart blog. This is a fantastic post, and it’s neat to see how Ottawa has changed, particularly for someone who’s only lived here the last 10 years. I also came from the Ottawastart page. WOW…that is so cool to see how the downtown area has evolved. Too bad the trains no longer head to the city core, that would be a site to see. Thanks for the history info, very interesting…. Yeah, it’s too bad they couldn’t have kept trains coming into downtown, maybe in a tunnel or something like that. Union Station has always looked like it would be a cool place to catch a train. Yes, it has. After this year’s Open Doors in particular, I got that particular impression quite thoroughly driven home. We lost out on something, for all the history that’s been made in that building since the changeovers. And it IS History with a capital “H”, to be sure. Thank you for taking the time to assemble this page. It is very interesting to view these pictures and your commentary in the context of our current issues of public transportation and the new Congress Centre. As a business owner in the Byward Market and board member of the Byward Market BIA, I realize we ALL have a huge responsibility as we shape our city. I’m glad you liked the post. And I’m also glad to see that the the owner of a prominent local business recognizes the importance of being involved in shaping the way our city develops. I remember writing and editing stories at the Fulcrum last year about the future of the university site’s development. It turns out much of the land owned by the U of O is part of a big brownfield from the days of yore when, as you point out, a whole bunch of rail yard ran across what is now campus. The second image is very special to me as my grandparents lived in the ByWard and often told me of skating on the canal. They were married in 1922 so the picture is from the time they were courting. I haven’t been to Ottawa myself since the mid 60’s so this was a great tour through the years for me. Thanks! Nice job, as I was looking a the photos I can see in my mind the buildings that we have lost in Ottawa. Another project if you want to see changes in Ottawa would be Sparks St. and Bank St from Wellington down. As for the comment about much of Ottawa U being from brownspace, that would be of some interest to the people who lived on Cumberland and College Streets who were “moved” to build it. I lost contact with a lot of folk back then (we did not have instant communication abilites) when their houses/schools business disappeared.